It seems like I keep taking a long time in between updates. Hopefully I will get better about that. I have been super busy lately though and not much has been done. One thing I HAVE done though is add weather effects! In the current build they are active all the time but in the future builds they will only be activated based on a random chance. Current weather systems are a dust storm, rain, and snow. I haven't decided if I will include varying degrees of each (i.e. a crazy rain storm, a blizzard, etc) but it should be easy to implement. Check them out below! It appears that GameMaker has fixed whatever it was that was messing up the HTML5 random-gen stuff. 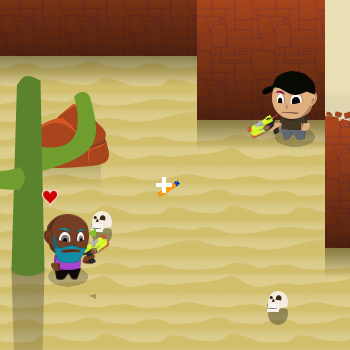 It now distributes enemies and items throughout the level like it should. However, the performance is now way worse. I'm not sure if that is to do with things I have added since abandoning HTML5 or what. In any case, as long as things keep running smoothly on the Windows version everything is good to go. I hope to get much more active again on this. There is so much I have brainstormed about even when I was super busy (and therfore not working on this as much). I am excited about where this is going! It has been a month since the last update! I had worked on it since then, of course, but never enough to actually release an updated version. I was working on something else and it took a lot of my time. I have officially cancelled the HTML5 build. Until I can figure out why it doesn't like randomly placing objects and enemies it is kind of pointless to keep exporting. Unfortunately that means you will have to download an EXE to play. The good news is that the game is currently only 2.75MB so it won't be a chore. I'll keep looking in to it in the future but I am wasting no more time on it for now. Weekly and Daily seed plays are now in and will only let you play them one time (though since there is still no save system you can just restart the game and play them again). I may implement the choice to input a seed number but I'm not sure. Levels now progress in a linear fashion. Each environment has 4 sub-levels and will have bosses at the end of each (maybe mini-bosses at the halfway point). You start in the desert first, then to the back alleys, then to the forest, then the snow, and lastly the dart throne area (I'm not sure yet what it will look like). The amount of enemies increases as you progress. Since I haven't put in ammo drops or crates and such you will probably run out of ammo as you progress at the moment. Lastly, I added a few miscellaneous things like a flash when you take damage, a door that spawns when all enemies are dead that takes you to the next level, and darts can now be picked up for ammo if they are laying on the ground (they will disappear rather quickly). Random level generation is in! I will most likely mess with the generation based on the environment but for now, the layouts are pretty nice I think! I do not have any of the objects like trees and rocks and such spawning in (or enemies for that matter) but those will come soon! I will also need to re-implement the sihouette system (and hopefully get it working for HTML5 but I think that may be a lost cause for it). Shooting darts now no longer sends them flying off for forever. Instead, at a certain point they drop to the ground. This value will be different for each gun so you will need to keep it in mind when choosing your weapon. You can also pick up darts that were shot and use them for ammo (currently they despawn after a LONG time but it will change to be much shorter). Finally, darts will now only stick to things they should stick to. Currently there is nothing in the levels that meets that criteria but there will be. After the last update I have spent a lot of time undo-ing all of the previous tweening and transitions in the menus. The main reason for this is that the assets I was using did not work correctly with HTML5 builds. While I'm not really sure I want it to even be an HTML5 build, it really bothered me that it would not work. I really like having that build on the website for easy testing and playing (and showing off :) ). So, I ended up using a different tween toolset called Tweenline. It works correctly with great performance in HTML5 and even seems to have a few extra features not found in BeTween. BeTween was still a great tool and if you like TransitionFX you will still need it. Unfortunately Tweenline does not have those included so I was unable to implement them. I think HTML5 has issues with those in general though because when I implemented them using a different method the issues were still there. I also re-did the pixelization transition into play and it turned out pretty good. I could probably find a way to use the shader from TransitionFX with Tweenline with a little modification but, meh, I think it turned out nicely. I also completely redid the main menu. When I made the switch to Tweenline I had actually recreated all the effects I had before, just with Tweenline. However I then thought about how to make the menu better and I came up with this approach. I think it is much better and definitely sexier! Currently I do not have the character options showing up so all you can do is play as the default but that will be the next thing to come! Also, press SPACE when in a level to generate a new one and check out the system. I just wanted to show off some tweening and transitions I have begun to implement. I didn't code these myself as I didn't feel I really needed to when there are so many good assets available. If I don't use all of the features it will definitely bloat my game files but since everything is still under 10mb (yup, really!) I don't think I need to worry about it. The project page is not updated with these features as they are pretty buggy with HTML5 (web) builds. I'm not sure they will ever be in the web build because of it, but they will definitely be in Windows builds! You can get the assets here if you want to use it for your own GameMaker projects! Dart Wars - Character Creation! Dart Wars has recieved an update! I added a Character Creation screen where you can customize and create your own fighter. It currently has a very basic implementation of gender (only the torso changes and is still difficult to see) but it will be more visible in the future. I added a few types of different body parts as well as added some masks in. 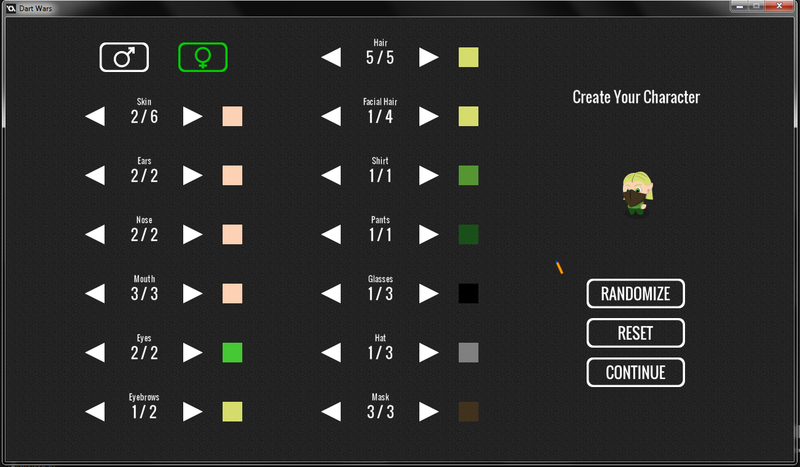 All items can be custom colored (aside from skin tones.. though that might change as well). It currently will not save your selections for the next time you play though. That is pretty easy to implement so it will probably be in the next update. Anyway I am hoping to save the next post for a much bigger update in the form of random levels to pave the way for a nuclear throne-esc experience! Then will come more weapons and ammo types! 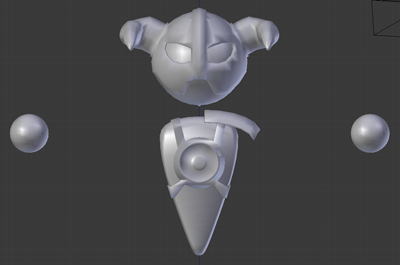 Possibly more enemy types as well! Since around this time last year I have been dipping my hands in to GameMaker Studio in an effort to satisfy an itch I have had for the longest time: to make games. I have been completely negligent in keeping this website updated with that process and I hope to change that, starting now. So far I have completed two games (though one needs a patch!) which you can find in the dropdown menu above. The first was Hobbox, a remake of an old school project from college. I used it to begin learning GameMaker and I feel it was a pretty good success, in terms of matching the old version. The second is The Amazing Alex Morton and the Trials of the Smeagol. This was a game I made as a gift for my 12 year old brother-in-law and takes aspects of things he likes or fears and tries to put them all together in to something he finds fun. I think this was the first time I truly realized just how much work making games is as it was much more complicated than Hobbox and burned me out a couple times. Currently there is no download link (it needs a small patch to fix an issue) but I hope to get it on here soon. It isn't the best game but I am crazy-proud of it! So, now... Dart Wars! You can find a link to the HTML5 (web) version in the drop down menu above. This game is simply one giant prototype where I am experimenting with different ideas and setups. It is also my first top-down game instead of sidescroller-platformer in GM. The idea of the game is to simply have a random Nerf-gun arena. Everything from the player, to the enemies, to the environment, and hopefully to the guns will be randomized for every game. "Paper-Doll" system: Characters are made up from parts that are randomly chosen and colored. This allows for extensive character customization as well as more varied enemies. Random Environment (setting): Currently there is a random chance for four different environment types (forest, desert, snow, urban). All the art and props change to reflect these environments. Top-Down movement and collision with correct depth sorting. Weapon firing and aiming system. Looting system (though no use for the gold coins yet). Silhouetting when the player/enemy walks behind a solid object (so you can see where the player/enemy is). However, the web version does not work correctly so it is currently enabled only in the Windows version. Random level generation (layouts and everything). Screen shake on different weapon effects. Text/Dialog engine, with ability for choices. Z-depth implementation for this perspective (for example: you can walk under a bridge or across it). Open crates/doors with dropped keys. Level progression where enemies become more difficult the longer you play. Basic multiplayer. I definitely want online and offline co-op but I am not sure about PvP yet. There are some current bugs ('stuck' darts sometimes take on the wrong depth and disappear, enemies get stuck on walls sometimes, in the web version the random character choices tend to not be random after one or two restarts, etc.) but everything will be squashed in the end. Or at least, that is the idea! The main goal I have for this game and all the systems it is prototyping is to provide some groundwork for a larger RPG-type game I hope to develop at some point! I can dream, right? 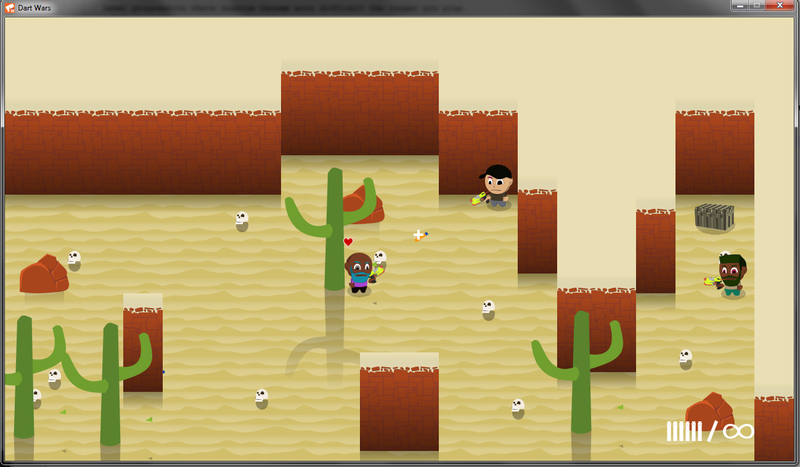 Here's the first screenshot of our "game" running. 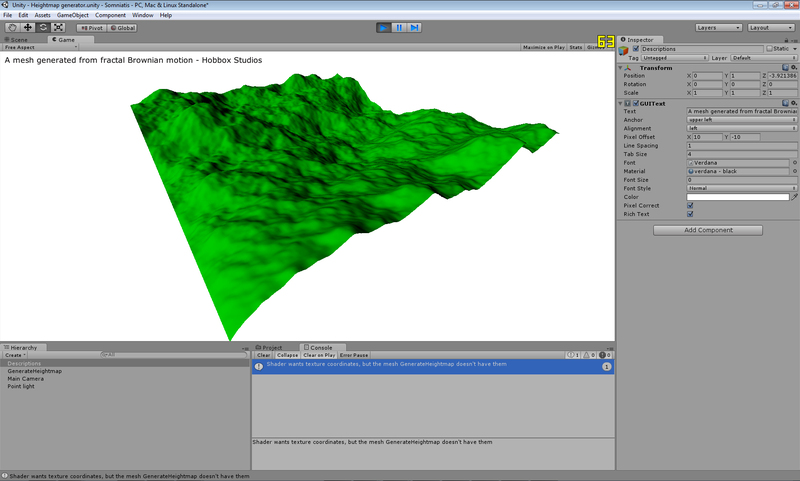 It features some bare, green terrain lit by a single directional light source. It's not much to look at, but a long journey has to begin somewhere. 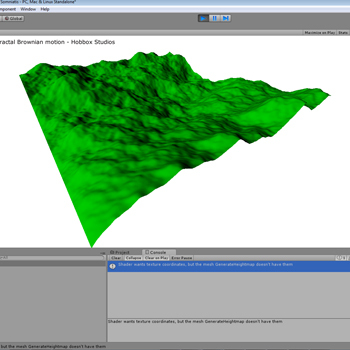 To generate the terrain, we're using fractional Brownian motion with Unity's built-in Perlin noise function. I'd like to try adding some color to the terrain as the next step. The second picture was created as referred to in the last part of that paragraph where he talks about adding color values. It is coming along great! Until next time!! Today I am putting down the first post about our project, Somniatis, in the massive realm of cyberspace. 'We' are Bradley Chick and Ryan Horton, and we are going to attempt the long hard journey of game creation. We are only two people so this may end in a crash of flaming glory, or it could end up being the most satisfying trip of our lives. We have already made one game together (see Hobbox), though it is basically a prototype that was used as a project for Ryan and has an issue with Windows 7 (it was made before Win7 existed). We have also collaborated on various other small projects and work really well together. Somniatis is Latin for 'To Dream' and was chosen for that very fact. On the one hand, it is our dream to make a game. On the other hand, this game very closely follows what I would consider to be my dream game. What is my dream game? Well, it is a very large and very in-depth experience and may be well outside of our abilities or spare time. Let's face it, a simple game is hard enough for a two man team let alone a large game. We hope to accomplish everything we set out to do though. This will mean we take baby steps and work on different aspects at a time. For instance, while I am working on figuring out exactly how we want the art direction to go, Ryan is working on getting the first step to the game finished: get a random landscape to generate. Any landscape, no restrictions or specifics. Just something. 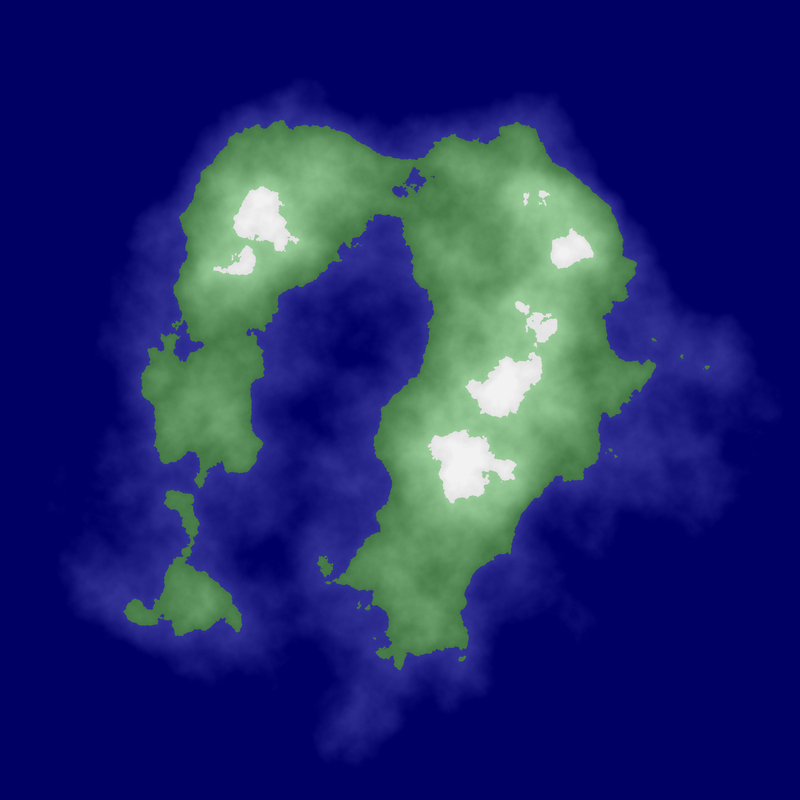 From there we will move on to more and more specific aspects of it like city areas, biomes, etc. In this particular picture, he is shown in an armor stylized in the fashion of the Dovahkiin from The Elder Scrolls: Skyrim! As you can see, we are not going for a realistic approach to graphics. There are multiple reasons for this, which I will talk about in a later post. For now, thanks for reading and here's to Somniatis! ©2017 Bradley Chick, All Rights Reserved.